Welcome to the bok choy soup recipes webpage. It talks about a very popular Chinese vegetable; how to clean, prepare, cook and grow it. Bok choy 白菜 (bai cai) is ubiquitous in Singapore. It is one of the easiest vegetable to prepare and eat. The stems are sweet, succulent and mild tasting. Hands down one of my favourites. When I do not know what to eat or buy, I invariably fall back on the trusty bok choy. It has many names and variations. Bok choy itself is a Cantonese transliteration, so is pak choy. Other common names include Chinese white cabbage, shanghai green and Chinese chard. It belongs to a very large vegetable species known as Brassica Rapa. There are 2 main sub-species. The first group, which is represented by the napa cabbage 大白菜 (da bai cai), have very broad and big milky white stems fringed with a bit of green crinkly leaves. 大白菜 literally means big white vegetable. The second group is represented by the bok choy, with crispy succulent stems and mild tasting green leaves. In Singapore, we refer to this as 小白菜 (xiao bai cai) which literally means small white vegetable. Apt descriptions, don't you think? Three kind of bok choy. Photo by Robin. There are many varieties of bok choy. See the picture above. All of them are considered bok choy. 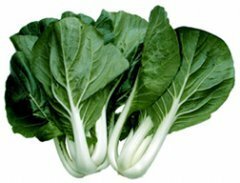 There may be regional names such as 上海青 (shang hai qing) but they are all collectively known as bok choy. Since young, I was taught to use my hands to prepare bok choy. It's easy. Just break individual stems off from the root. Break longer stems into smaller pieces and halve the bigger leaves before cooking. Cook the stems first before adding the leaves as the leaves cook faster. I have seen chefs in cooking shows using a knife to slice off the bottom. I find it wasteful as each part of the stem, even the part closest to the roots (what roots?) can be eaten. I advocate just breaking off the stems with your hands. Chop them into 3cm or 1.5in chunks for stir-frying or in soups. Easier to eat too. The fastest and easiest way to cook with this Chinese vegetable is to quick fry it with some chopped garlic and lightly seasoned with soy sauce or oyster sauce. Any number of ingredients can be added to this basic mix; chicken, pork, beef or mushrooms and more. The picture below is a stir-fry dish with bok choy with chicken and seasoned with plum sauce. Written recipe not needed. Stir-Fried Shanghai Bok Choy with Chicken in Plum Sauce. Photo by Kim. Another fuss-free way is to blanch them in hot water and serve drizzled with a mixture of oyster sauce, soy sauce and sesame seed oil. Topped with crispy fried shallots. No need for a written recipe. They are great in soups (Of course!). Just like mung bean sprouts, throw them into your soup at the last minute for a quick boil. Bok choy works well in quick boiled chicken soup like this one: chicken soup with baby bok choy and honey dates. It also works well in noodle soup. Try this one with instant noodles and pork meatballs and this one with glass noodle. For those who must have some written instructions and proportions. Here are 2 recipes. This recipe produces an Asian broth with a little heat. A vegetable stock is used here, making this a vegetarian soup. I usually separate the bok choy stem by stem and break them into smaller pieces by hand. However, this recipe calls for chopped bok choy, so there is no need to separate the stems from each other. Just chop away. Be careful when handling the chilli as the seeds contain the most heat. Do not touch them with your fingers. Wear gloves if possible or just use the back of the knife and scrape them off. This recipe is a really basic one. If you have leftover meat cuts like pork or chicken, you can add them to the soup. Heat up 2 tbsp of cooking oil in a rounded pan, fry the garlic quickly. Bok choy are delicious and easy to prepare. They are also quite easy to grow. If you have a vegetable garden, buy some seeds and try it out. 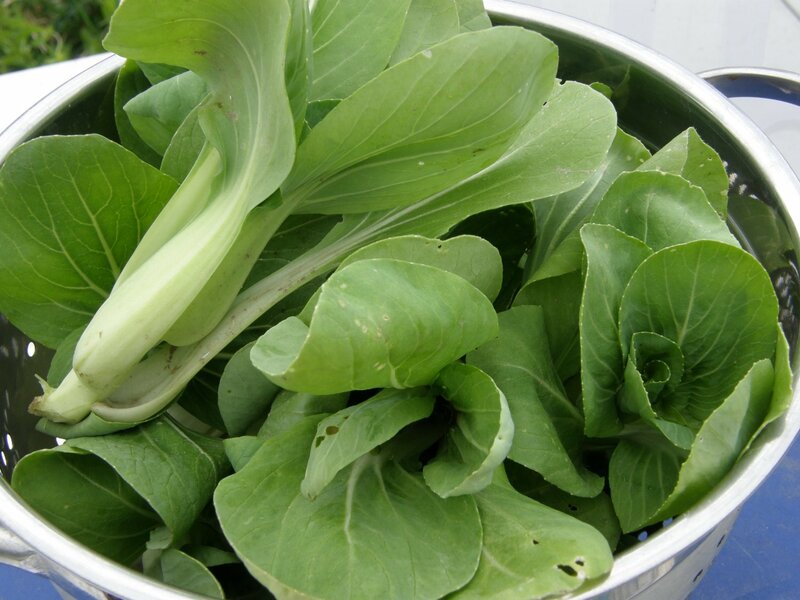 I hope you find this article on bok choy recipes, how to prepare and grow it helpful.